Another fabulous design by Canadian aeromodeller Bob Bishop, the Curtiss P-6E Hawk is also for the experienced builder looking for something perhaps a bit different, but very pleasing to the eye! 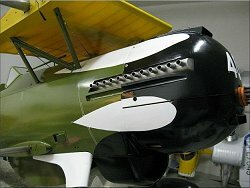 The full size P-6E was one of several variations of Curtiss Hawk, a fighter biplane developed in the late 1920s. Just 46 P-6Es were produced, serving two squadrons in the early-mid 1930s. Accidents and the lack of overhauls meant that numbers of the plane naturally declined, and now only one survives in the Smithsonian National Air & Space Museum, Washington. 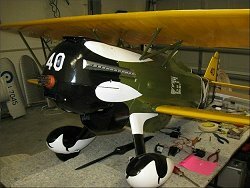 Bob's Curtiss P-6E Hawk design is a giant 1/4 scale model, with a wingspan of 94.5 inches and for a 50cc gas engine. 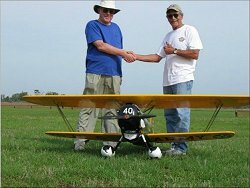 Bob's Hawk is a large 1/4 scale model, its size and bulk emphasized by the fact that it's a biplane. Because of its size there are 9 CAD-created plan sheets, available in printed form or PDF files that you can save to your computer and have printed locally. 9 printed CAD plan sheets: $55. Shipping & handling (plans rolled in tube) within the US: $12.50. ** Please note that the PDF files are not an automatic download; they will be sent to you by the designer. 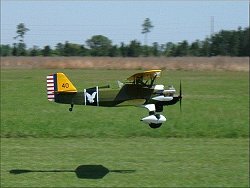 RC Curtiss P-6E Hawk plans - $55 plus shipping. Ordering concerns or problems using the above button? Contact me. P-6E laser cut parts set. There is a set of laser cut parts available for the P-6E Hawk, containing all the balsa and ply parts from the plan (formers, ribs etc.). The parts set does not include any sheet or strip wood; this must be purchased separately by yourself. Also note there is no hardware included in the pack. RC Curtiss P-6E Hawk laser cut parts set - $250 plus shipping. If you'd like to order the plans (and laser cut parts set) for this RC Curtiss P-6E Hawk, please use the Paypal buttons back up the page. RC airplane plans - index to Bob's plans available to buy.